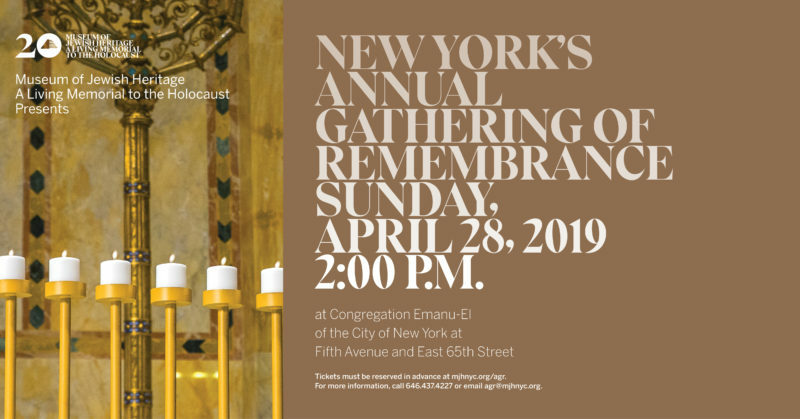 The 2019 Annual Gathering of Remembrance—New York’s largest Holocaust commemoration—takes place on April 28 at 2 PM. In 2018, more than 2,500 people attended the Annual Gathering of Remembrance in person. More than 100,000 watched it live online. The 2018 recording is available below, as well as on the Museum’s YouTube channel. Commemorations like the Annual Gathering of Remembrance are powerful because they demand our presence, our attention, and most of all, our togetherness. They challenge us to think of how we carry not only our personal, individual histories, but also the history of our people. The weight of this history can feel like a burden, but when the burden is shared, it becomes an important lesson in what we mean to each other. We owe it to our people, ourselves, and our children to insist that when we mourn those who were killed and comfort those who suffered, we tell their story with precision, accuracy, and the utmost respect for their human dignity. We will not contribute to an already enormous loss by allowing ignorance and prejudice to deny the complex lives that were brutally cut short or changed forever. We will not forget. Twenty years ago, the Museum of Jewish Heritage – A Living Memorial to the Holocaust was dedicated by survivors. Since then we have welcomed more than two million visitors to our Battery Park City home, emerged as the primary resource in New York for teaching and learning about the Holocaust, and taken our place as the third largest Holocaust museum in the world. Survivors remain the core and driving force of our community. As a living memorial, one of our sacred mandates is to magnify their voices and preserve their testimonies. When a survivor tells her story, she re-asserts the very humanity and dignity that the Nazis attempted to destroy. We offer as many opportunities as possible for survivors to speak to school groups and members of the public. “Never forget” is a call to action and a call to teaching. It’s a call that the Museum—our Museum—answers every day. At the Museum of Jewish Heritage – A Living Memorial to the Holocaust, our teaching extends far beyond our own children and grandchildren. Young people of all backgrounds enter our doors to learn about the Holocaust and to remember. We defy the Nazis’ attempts to dehumanize and destroy the Jewish people. We remember the history of the Holocaust as a history of individuals—and this in itself is an act of resistance. Thank you for being here today, and for undertaking the difficult and crucial work of remembering.